Is it different this time? Yes. We're starting from lower mortgage rates while real income levels have fallen and/or stagnated since 2007. When rates bottom and move upward from these insanely low levels it will be even more painful for buyers that purchased at the new peak. Rising rates will not impact current homeower's monthly fixed mortgage payments, it will impact the monthly mortgage payments for new buyers who want to purchase a home. Buyers will have to offer lower prices in order to afford the monthly payments with higher rates. Home prices will adjust downward. 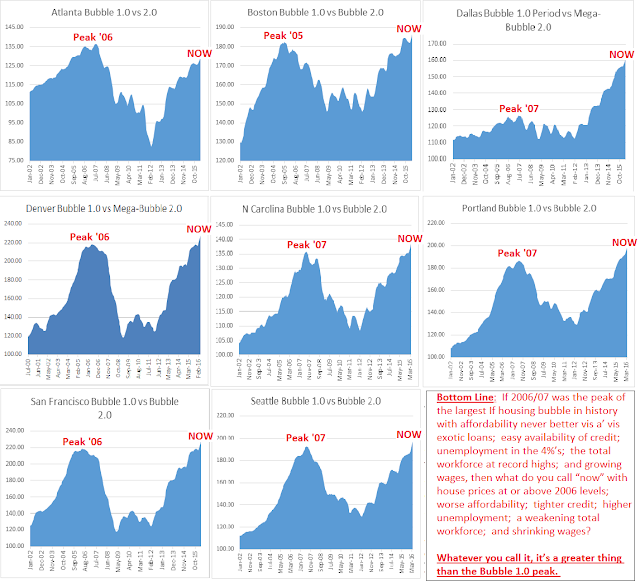 While bubble home prices were the main event during the last credit crisis, this time they will be just a blip on the radar during the coming global credit market collapse. The new credit bubble has infected the entire global bond market, which is hundreds of trillions of dollars in size (U.S subprime mortgages topped out at $1 trillion). The global bond market bubble has simultaneously and artificially pushed up asset prices for stocks and commercial real estate. While many people will lose home equity during the next downturn, it will likely be the least of our worries as credit markets implode around the world. Chart above from Mark Hanson. Kyle Bass On China: "The Next Crisis"